Beer and punk rock, the two go hand in hand. Philadelphia is no stranger when it comes to either of these scenes. In the last few years, the City of Brotherly Love has been heralded for their punk and craft beer scenes. More recently, a group of long time friends got together and gave the terms “hand in hand” a more literal example. One of the Philadelphia’s biggest and most buzzworthy from each world joined forces recently when long time buds Jeremy Myers, head brewer for Neshaminy Creek Brewing Company, and the Menzingers teamed up to create their very own and unique brew. Aptly named “Menzinger” their creation is an “Imperial Kolsch”, a rare sight in the beer world. This Saturday, Neshaminy Creek Brewing Company is releasing it to the world and they are teaming up with the Menzingers to help celebrate. At the same time, The Menzingers have been equally busy putting out two incredible and well received albums, On The Impossible Past and Rented World. “Our schedules haven’t really aligned because we’ve been so busy. Finally we just said we’ve got to do it and we went for it,” May adds. 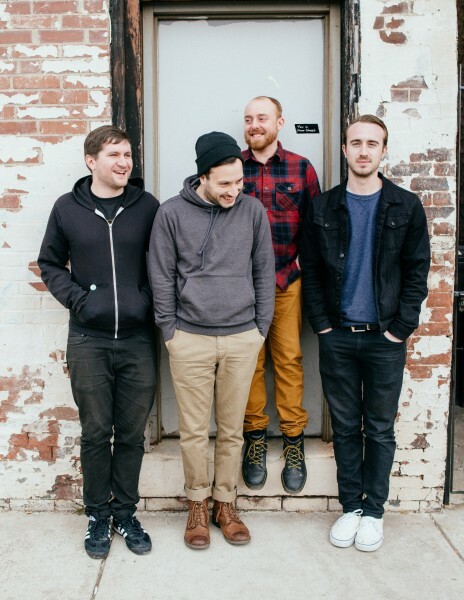 Right before the Menzingers kicked off their co-headlining tour with mewithoutYou, the guys made a trip up to Croydon, PA to get down to business. After tossing ideas around, the Menzingers and Myers decided to take the easy drinking Kolsch style of beer and beef it up. “We wanted something that had a nice high alcohol content and hoppy flavor, but not too bitter because all four of us have different beer preferences so far.” To accomplish this, American hops were subbed in place of the traditionally used German variety. The result? A heavy hitting yet easy going Imperial Kolsch. For it’s inaugural batch, the collaborative Menzinger will only be available at Neshaminy Creek Brewing Company. The first pours will begin this Saturday around 5PM. 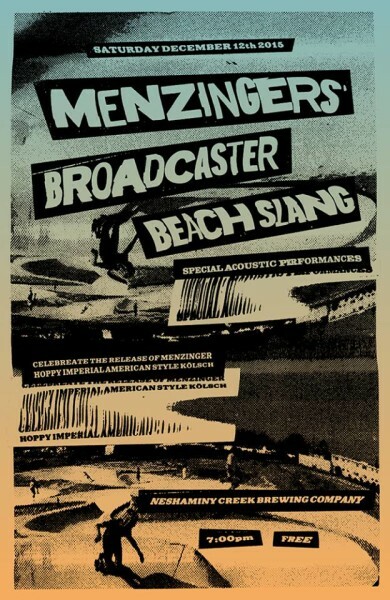 Greg and Tom from the Menzingers will be playing a special acoustic set while their rhythm section, Eric and Joe, will be guests behind the bar. Joining the festivities will be Broadcaster and fellow Philly band Beach Slang (who’s drummer JP Flexner is behind the fantastic artwork and labels of NCBC’s beers). “It was fantastic. You’re building something. You’re using live cultures to create something as wonderful as beer,” Mays says as we go on about the band’s experience. Nothing like using live cultures and longtime friendships to create even more culture and friendship. Be sure to make your way up to Croydon this weekend to welcome Menzinger into the world! Neshaminy Creek/Menzingers Collaboration Brew Day from Neshaminy Creek Brewing on Vimeo.